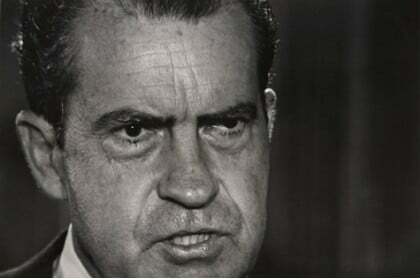 Is Hillary Clinton the Democrats’ Richard Nixon? 1: Both were highly successful politicians who hadexceptionally negative net-approval ratings from the U.S. public, but were viewed highly favorably by the voters within their own Party. 2: Both were unsuccessful in their first run for the Presidency, but managed to come back and ran considerably more successful campaigns the second time around. 3: Both were highly distrusted, except by the voters within their own Party. 5: Both were war-hawks and proponents of a big military, but were also liberals on social policies and regulatory policies (for example, Nixon signed into law the National Environmental Policy Act, several environmental initiatives including the Clean Air and Clean Water Acts, the Mammal Marine Protection Act, and the creation of the Environmental Protection Agency; and, he started the Earned-Income Tax Credit, which « now lifts more children out of poverty than any other government program”). So, she is promising regime-change in Syria and saying that it’s the prerequisite to defeating ISIS — which is an absurd lie, since ISIS, and Al Qaeda, and all the other jihadist groups who have flocked into Syria to overthrow and replace Assad, are certainly not the way to defeat ISIS, nor to defeat the other jihadist groups there, all of which are anti-Assad, as is Clinton herself. Clearly, then, her ‘plan’ to win the war in Syria is, essentially, to replace Assad with jihadists — to whom the U.S. is sending thousands of tons of weapons. Her Big Lie there is merely stupider than Nixon’s (it’s transparently stupid, because both she and ISIS aim, above all, to overthrow Assad), but it’s just as much a lie about war-and-peace as was Nixon’s ’secret plan to end the Vietnam war’; and, in that sense, it is remarkably similar and (like Nixon’s lie was) can be believed only by liar-trusting fools, including virtually all members of the candidate’s own Party, plus a large percentage of political independents. 6: Both Richard Nixon and Hillary Clinton were/are famous for being secretive, and for distrusting everyone except his/her proven-loyal personal entourage — loyalty is a higher value to them than is any other. They are paranoid — very us-versus-‘them’ — and all-too-willing to use unethical means of defeating ‘them’ (not really the American people’s foreign ‘enemy’, but, above all, their own domestic “enemies-list”). 7: Both Nixon and Clinton famously use curse-words profusely in private, and treat their subordinates like trash, and rule them by fear. 8: Both of them had/have established records backing coups abroad, in order to impose the will of America’s President, no matter how bloody (such as the coups that overthrew Mossadegh in Iran in 1953 and Allende in Chile in 1973, and the coups that overthrew Zelaya in Honduras in 2009, and Yanukovych in Ukraine in 2014).